My boyfriend and I recently returning from a stomach bulging trip to New York where we feasted on enormous pastrami and gherkin sandwiches, soft bagels crammed full of salt-cured smoked salmon and cream cheese and flavoursome burgers served in rich brioche buns with finger-licking fries. New York surpassed all expectations and I loved its energy, dramatic architecture and exploring the contrasting different neighbourhoods. And the food! The standard and variety was just incredible: Italian, Korean, Mexican and American were just some of the cuisines that we dipped into and we were continually striving to work up an appetite for the next exciting meal. I’m still heartbroken I didn’t have any room for a hearty slice of classic New York cheesecake, which was on my must-eat agenda – I tried, really tried –but I just had no room despite walking till our feet throbbed and our muscles ached. Even though we ate like kings and food was fantastic, I have returned seeking some healthy, light food. It wasn’t all burgers and pastrami sandwiches, though, and this recipe is inspired by a melon and prawn salad I ate on a hot day in a café in pristine Old Greenwich, Connecticut. This salad is perfect for a warm summer’s day as the abundance of fresh herbs, left whole in this recipe, with the watermelon and lemon is so refreshing and lively. Then add some juicy prawns, salty feta and crunchy tart pomegranate seeds and you’ve got a beautiful delicious, satisfying salad. It also is very quick to make and the only cooking, which is very brief, is to sauté the prawns. Next time I will use a griddle pan to give the prawns a lovely smokiness, which will work really well with the cooling watermelon. 1.Heat olive oil in a frying pan over a medium-high heat, season the prawns with salt and pepper, add to pan in batches and fry, turning once, until golden and just cooked through (about 2-3 minutes). Set aside. 2.Combine herbs, drained onion, lemon juice and extra virgin olive oil in a bowl, season to taste, toss to combine and set aside. 3.Arrange watermelon on a platter, top with the prawns, scatter with feta, pomegranate and herb salad, drizzle with extra virgin olive oil, season to taste and serve. 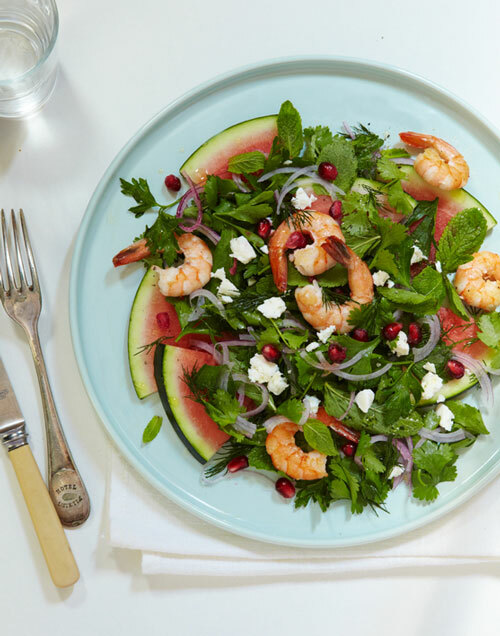 This entry was posted in Recently cooked and tagged feta, healthy salad, herbs, pomegranate seeds, prawns, summer salad, watermelon on 08/06/2013 by Val McArthur. Hi Sarah. Apologies for late reply. The salad is so vibrant, isn’t it. Glad you like it. I was so full I didn’t have room for many sweet things in NY; those pastrami sandwiches are so filling! I mainly gelato but I was very upset I didn’t do some famous cheesecake. Next time! What a great summer salad! Glad you enjoyed New York-so much to try here, so I agree that it’s tough to fit all your favorites in. If you didn’t have the chance to stop by Sprinkles cupcakes, I’d definitely recommend it for your next trip! Absolutely loved it! So much to see, so much to eat. Isn’t New York just amazing. Boy, my feet were sore! Couldn’t help but peer around the next corner, though.